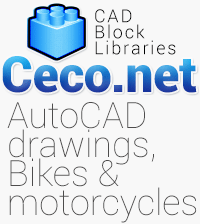 Description for this Autocad block : Autocad block of Harley Davidson Motorcycle Model FLHX Street Glide in top or plan view. Classic motorcycle, vintage motorbike. These autocad drawings are in dwg and dxf format.